Eden Montgomery arrived in the lawless territory of Whistle Creek as a newlywed, but she quickly lost her husband to his mistress…gold, and the claim he called The Golden Angel. When a premature blast at the cave killed her husband, and took the life of her unborn baby, Eden closed the mine…for good. Now she runs the local supply store, and in her bitterness, looks down on the men who shirk familial responsibilities in pursuit of something as meaningless as gold. My name is Sarah Jae Foster. I was born and raised in the beautiful Pacific Northwest. Growing up, I spent a lot of time with my grandma and every Friday and Saturday night, we watched all of the old, classic westerns on TV until about 2 in the morning—it was the best time! 2) Have you always wanted to be a writer? I never thought about being a writer when I was “growing up”, but I read about two books a week beginning at age 9 or 10, so I’ve always loved literature. What do you think contributed to that decision? The moment I decided I wanted to read stories that I could no longer find in the Christian market. That and, I’ve always researched history, I can’t think of a better opportunity to put my years of research to use—to entertain! I have a passion for reading and researching American history. 3) What led you to write in the Christian genre? It’s the genre I know best and all I read growing up.. I’ve since broadened my horizons and have found many more extremely talented authors. 4) Why don’t you tell us a little about the book you are currently promoting? Why are you passionate about it? 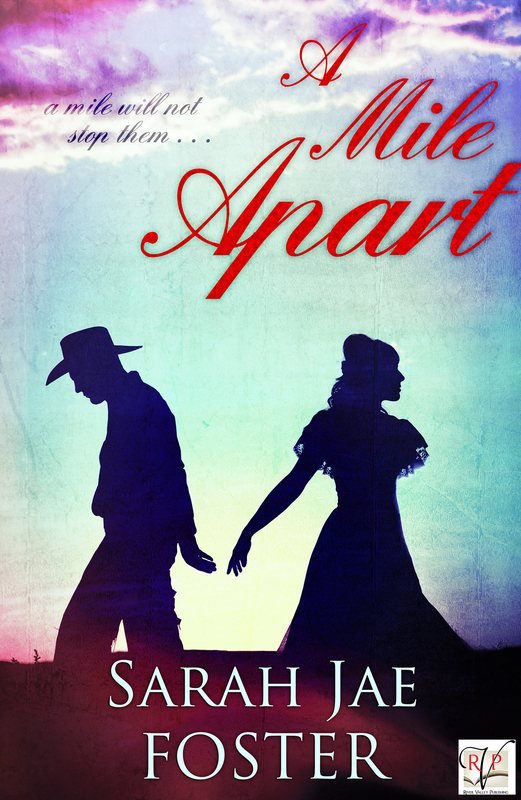 I’m so excited to share about A Mile Apart! I began researching mining in the 1800’s years ago, it’s always intrigued me…that pull, that addiction to find the next gold strike. Last year I finally sat down and the story began. I LOVE Eden! And Joseph, well, he’s a very unlikely hero, but I kept it raw and real to the time period. 5) Do you have any other titles already available or coming soon? I would like to share about The Heart of a Soiled Dove, as it’s my first Amazon top 100 best-seller in all categories. It is a historical piece dealing with an ex-prostitute and her attempts to rescue other soiled doves from their surroundings. It is packed with evil sheriffs, pimps and soiled doves—the topic was definitely a challenge to keep true to the guidelines of the CBA. 6) How did you develop your writing? Going to conferences, utilizing and knowing the importance of a professional editor. Feedback from mentors and industry professionals. 7) How do you write – lap top, pen, paper, in bed, at a desk? 8) Tell us about your new book? What’s it about and why did you write it? I am beginning to write the second book in the Soiled Dove series. Women in the west are my heroes. The things they went through and their tough skin, is something to honor. Book #2 is about another former soiled dove, overcoming life as it was handed to her. 9) When you are not writing, how do you like to relax? I LOVE going to the spa and am grateful to be able to do that. I also read and enjoy watching thought-provoking, edgy films or TV series. 10) How often do you write? And when do you write? At least 5 days a week. Afternoon and evening. NOT a morning person. 11) What do you hope people will take away from your writing? How will your words make them feel? From the reviews, I’m gathering that readers appreciate the overcoming and restoration that happens in my novels. 12) Do you intend to make writing a career? I was able to quit my day job Nov. 2013, so, yes! 13) What is your greatest strength as a writer? Keeping Christian fiction clean, yet real, raw and edgy. 14) Will you write others in this same genre? I will always write about the wild west. I have one contemporary out and plan on writing two more, but they are challenging for me. Writing a western comes natural. 15) Is there a message in your novel that you want readers to grasp? I don’t try for any messages. I want a reader to enjoy my writing, first and foremost, it’s entertainment. 16) Where can we purchase your books and how can we stay connected with you?